All I wanted to do was give a donation to the North American Conference on Ethiopian Jewry (NACOEJ) while I was in Israel. But from that simple desire came one of the high points of my recent trip. First PersonBefore I left for Israel to attend February’s Rabbinical Assembly convention in Jerusalem, several members of my congregation gave me tzedakah to distribute there. One of my favorite organizations is NACOEJ. I knew of their work with Ethiopian Jews in Addis Ababa who were waiting to leave for Israel, and of their continuing efforts to help these Jews integrate into Israel society. Rabbi Ronald Roth meets with Orly Tagedye in Ramla. Surfing on the Internet, I learned that NACOEJ had an office in Jerusalem, so I called the New York office to tell them that I would stop by their Israeli office and leave my donation. When they heard I was going to be in Israel, they suggested that I visit one of their Limudiah sites – intensive supplementary after-school programs in Israel where Ethiopian Jews are helped to succeed in school. I felt I could not refuse. There was no such program in Jerusalem, where I would be staying, but there was one in Lod, near Tel Aviv. Since there was no direct bus service from Jerusalem to Lod, I planned instead to visit Ramla, where there was another Limudiah program. Some eight years ago, when my daughter, Deena, became a bat mitzvah, she twinned with a young Ethiopian woman who lived there. We made a donation to NACOEJ, and the two young women exchanged letters and photos. I went to my files and found the letter we received from Orly Tagedye of Ramla. I again called the NACOEJ office in New York and then the office in Israel. They said they would try to find Orly; if possible, I would meet her as well as observe the after-school program. When I arrived in Jerusalem, I learned from the NACOEJ office that not only had they found Orly, but they had arranged for one of their part-time employees to drive me to Ramla. Orly would meet me there. Who would have imagined such a meeting? The story of the rescue of Ethiopian Jews has always resonated deeply within me. It was the only time that black Africans were taken out of Africa, where they were persecuted, to live free in another land. Every Passover I put a pillow in a cover embroidered by Jews in Addis Ababa and recline on it as I lead the Seder. On my second day in Israel, I went to the NACEOJ office in Jerusalem. Their special projects manager, Kassahun (the equivalent of Jonathan in Amharic) Wondie, drove me to Ramla to meet Orly, who showed me an envelope. I recognized my handwriting on it. She had saved the letter from Deena as well as two photos I had sent to her. I showed her the letter that she had written to my daughter. She told me about her plans. She was studying for the Israeli equivalent of the SAT exams and looked forward to going to Bar Ilan University and becoming a social worker. Here, I thought, in a hallway of a school in Israel, two Jews meet for the first time. I thought of the midrash that says all Jews were present when the Torah was given at Mount Sinai, but that was a long time ago. My family had traveled to Europe, Poland, Russia, Moscow, and Riga – and then by way of Brooklyn and Nashville I arrived in Fair Lawn, N.J. Here I was with a fellow Jew whose journey took her to Ethiopia and then to Israel. We chatted about our families and our hopes for the future. I felt transported beyond my simple existence into a realm of Jewish history much larger than myself. 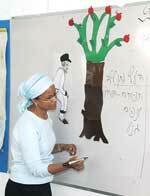 Ethiopian students in Israel learn about Tu b’Shevat. Kassahun took some photos of me and Orly, and then we parted. I went to see the Limudiah program. It was Tu b’Shevat. The students were studying and eating fruits. I heard their teacher ask, “What did the boy give to the tree and what did the tree give to the boy?” It sounded familiar. Then, looking at the white board where the teacher had written notes, I realized they had read a Hebrew translation of the book “The Giving Tree” by Shel Silverstein. I thought of the many times I read that story to students in my synagogue. I went to Israel to attend a convention and to learn Torah. I wanted to spend a few days on my own in Israel before the formal program began. At one point, I thought I would go to Petra, across the border in Jordan, to see one of the world’s greatest wonders, the remains of a grand city carved in stone. I chose not to do so. Instead, I traveled to Ramla. Unlike Petra, Ramla is not one of those sites listed in books such as “1001 Places You Must See Before You Die.” However, I did experience one of the great wonders of the world: meeting Orly in person, seeing my fellow Jews living freely in Israel, and watching the cheerful faces of children learning our heritage. All I can say is thank you NACOEJ. For Orly and for all the Ethiopian Jews in Israel, the story of Passover has special resonance. I was fortunate to be able to meet those who so recently experienced redemption.